It's especially gratifying to find a new river and a few holes that produce time after time after time... I guess that you could call it the "secret place" that you kind of want to keep to yourself. A place to go to when you need a "pick me up". A place that isn't crowded with other anglers. A place that can take two or three flies without having to put the guessing game into play on what the finicky fish are going to take! Oh, I'm sure that most of you have one of these type of places! Non-Finicky Brown Trout #3... what's your guess? The ice breaker... goes after a pink sow bug! So, I have my homey brown trout water. Next, I have found a little spot that gives me my share of rainbows... I mean, I am an equal opportunity angler. The first time out, I got a little excited about what I found there. And the fish were excited to see me too! Just don't ask me to do that again... Ha. No way could I get an action pic like this one with my fish flying out of my hand while the camera snapped as it went down my waders... Lol. This little getaway place has a lot of rainbow "planters". But, it keeps you busy catching as they are very hungry little varmints! And then after maybe the first dozen of those, you just might get lucky and haul in the trophy of the bunch. So, I think that I'm set for the winter months. 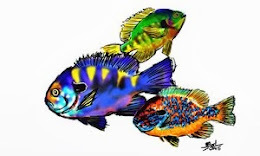 I have a couple of places to go to get my fish fix for the week. New "home water" has actually surprised me. I have put my go-to river on a temporary hold while searching out new places to fish. New water is fun and exciting! Just keep me from falling over rocks. 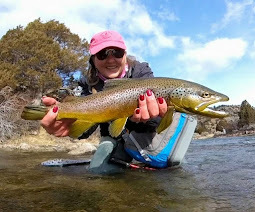 Oh, that is how I became so very cold on brown trout day... An awesome day ended with me trying to hold onto the "whopper" (no, not the one in the photo above) at almost dusk. 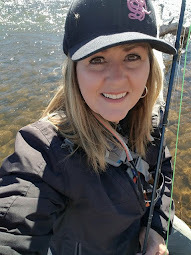 After tripping over some large rock and leaving me with a tight line high in the air while still on my knees... that darn trout took off across the pool and wrapped my line around something down under. Fish gone, Flies gone, A cold, River Damsel! It was epic. And since it was in the twenties and at the end of the day, this "snowman" headed for the car. Sorry... no vid. = ) It was one of my better moments... haha. Do you know what the fish think those flies are? Scuds? Well, I was thinking maybe a hare's ear, as I was hitting on that before.. But, it could also be close to a scud... I think the copper was what set it off,,, I have an experiment for this weekend. Stay tuned. I've got some new winter water I'll be fishing here in this weekend. A great day, nice Browns and a beautiful Rainbow. The third picture up, your hands look like they are so cold they could crack. Think it's just the lighting, at least I hope so. Oh yeh, good aerial photo too. I was surprised and delighted all at the same time. This is going to be a good winter. = ) The rainbow was the last fish of the day... so,my hands probably were COLD!!!! Haha. Gotta love the blooper photos. Blog worthy! RD, little country music lyric for you here. 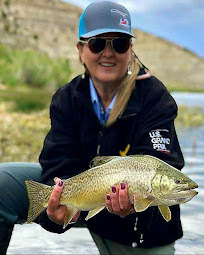 "When I was young and in my prime, I went fly fishing all the time! Now I am kinda' old and maybe past my time, just enjoy reading about The Damsel chillin' with her nymphing line". I really look forward to reading about your fly fishing escapades. Proud to be a BlogBuddy of The Damsel. Oh, happy to see that you like chasin' Rainbows once in awhile, too. 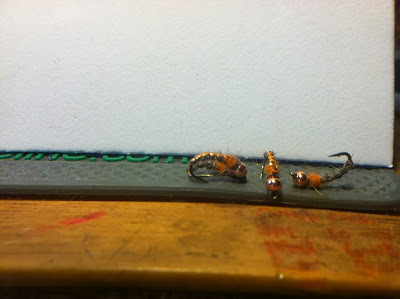 The only time that I use dry flies in the winter is if the fish are coming up after midges in a big way... Then, I will throw on a griffiths gnat or something like that and trail it with another midge... 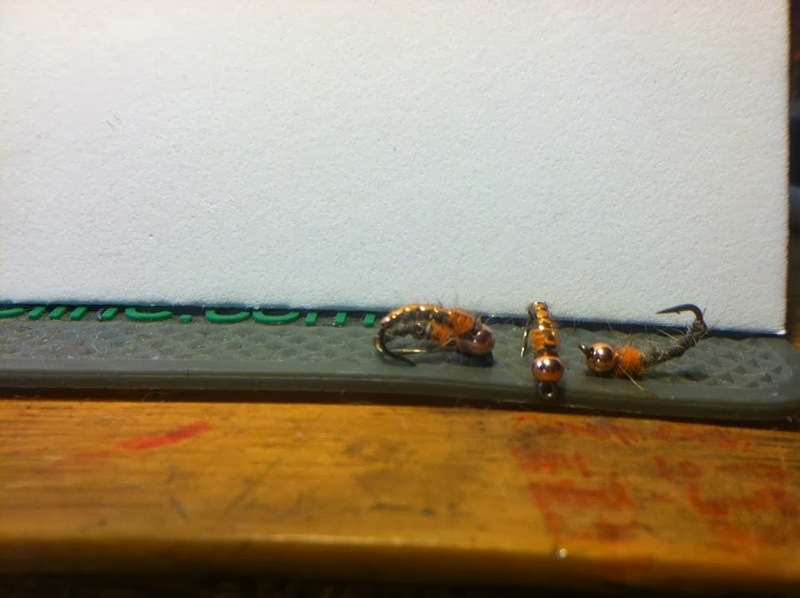 But, my favorite winter set up is a size 16 attractor nymph with a size 20-22 midge or midge emerger trailing it... I almost always have a small yarn indicator on at the top of my line. Underneath the water, the copperback was the top fly (attractor) and followed by a small sow bug at the end, about 16-18 inches apart. Sure wish that we could fish together... Come back out here again and we will!!! No, I'm not going to sing to you and I won't write you a poem, but I do love the River Damsel. Such a good friend. (thinking that this might get me some cookies...) When I first started fly fishing, it was mostly nymphing. The big difference between you and I is I've improved my dry fly fishing and you've outdone me nymphing. I don't care, I love it all. Don't give up on me, we just might make it happen---HOPE YOU GUYS HAVE A MERRY CHRISTMAS !! Yup, never say never... Merry Christmas to you and your family also!